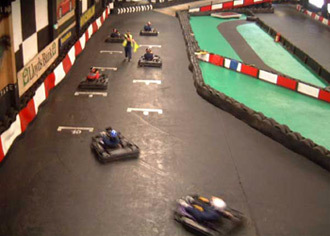 Supakart Newport is one of the most exciting indoor kart tracks in Wales, which includes, a tunnel, a mix of hairpins, a banked figure of eight and a 450ft bridge with cross over.The facilities to include showers, changing room, large modern reception, large electronic scoreboard, lighting display, air conditioned cafe and a video briefing room capable of holding up to sixty drivers. The cafeteria is upstairs next to the heated spectator balcony, giving drivers a quieter air conditioned area to relax between races.For those looking for a corporate event the track also has an excellent conference room with all of the usual facilities that are required by blue-chip customers. Leave M4 at JCT 24 and take the A48 (be aware the road markings also show A455) Newport industrial area (4th exit from M4 EASTBOUND) (1st exit from the M4 WESTBOUND). Carry on straight over the next two roundabouts and take first exit left at third roundabout and follow road over the railway bridge. Take second exit at roundabout (In between KFC and Citroen Garage), signposted 'Leeway Industrial Estate' and Supakart is located 200 yards up the road on the right hand side. Ten minutes qualifying for your grid position then a non-stop 30-minute race with trophies for the top three drivers. A one hour exclusive event for up to 8 children, all drivers will receive a full safety briefing and a few practice laps then qualifying heats and a Grand Final. Every child gets a turn, with medals and a place on the podium for the top three. (Min height 120cm) Food is not included, but can be added if required.